Lenovo is one of the leading IT software and hardware manufacturers in the World. This company has recently acquiesced over IBM personal computing division. The company has introduced many products which have great durability, construction and quality. Company deals in many gadgets including laptops, desktops, tablets, mobile phones and other computer devices. 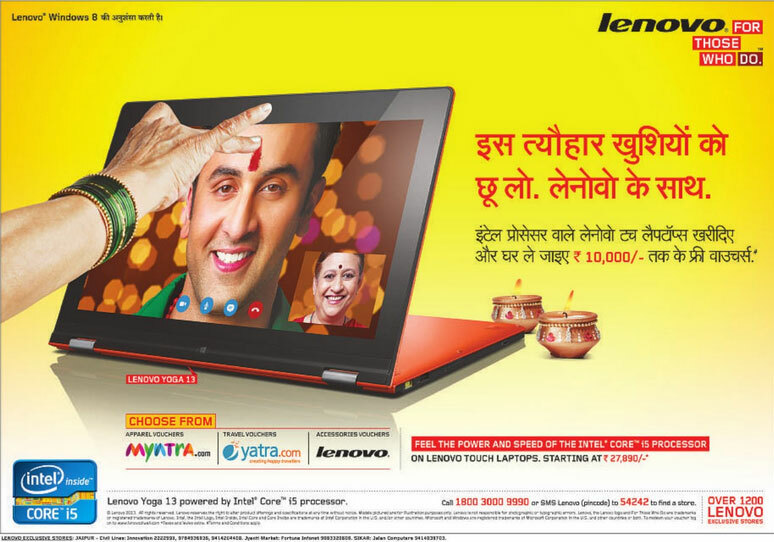 With the occasion of festivals, Lenovo is offering great deals on their laptop computers. The company offers free voucher of upto Rs.10,000 on their Intel processor touch laptops. The offer is available on Lenovo Yoga 13 also. These vouchers are available on myntra.com, yatra.com and Lenovo accessories. Company promotes the Intel i5 processor and recommends Window 8 operating system.